William Shakespeare’s last will and testament provides one of the richest surviving documents for understanding his familial and professional networks. The will names many of the important people in his life, including family, friends, colleagues, and neighbors, as well as describing specific pieces of personal property. The handwriting does not match that of Shakespeare’s lawyer, Francis Collins, suggesting that the will was drawn up by a clerk. 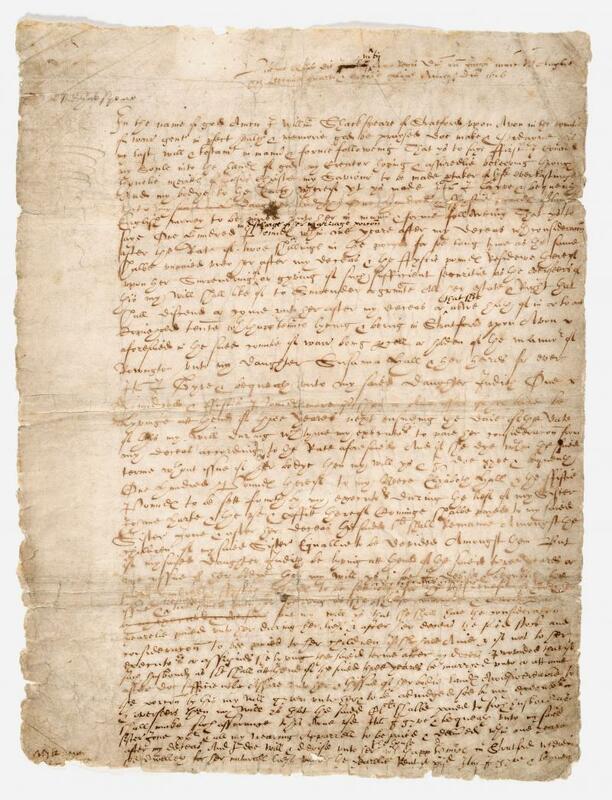 The document is written on three sheets of paper, with William Shakespeare’s signature appended to each sheet, as prescribed in contemporary manuals. Most individuals in early modern England did not begin writing a will until death was imminent. Many scholars believe that when Shakespeare sent for Francis Collins (who had also drawn up the deeds of bargain and sale for the Blackfriars gatehouse) to draft his will, he was almost certainly ill, although he did not die for another several months. The signatures are written in shaky strokes of the pen, suggestive of someone who had trouble holding a writing implement due to illness. Scholars have suggested that the will was drafted in January, then revised and partially redrafted on March 25 to reflect the change in the marital status of his daughter Judith. She married Thomas Quiney just over a month earlier, on February 10. At the top of the first leaf January is crossed out and replaced with March. On the same leaf, a reference to Shakespeare’s son-in-law is altered to his daughter, Judith. On the second leaf a section making provisions for Judith “vntill her marriage” is deleted. Thus it is thought that the first leaf was entirely rewritten and then revised, and that the second and third leaves were merely revised. In the name of god, Amen. I, William Shakespeare of Stratford upon Avon in the county of Warwick, gent., in perfect health and memory, God be praised, do make and ordain this my last will and testament in manner and form following, that is to say, first I commend my soul into the hands of God my creator, hoping and assuredly believing through the only merits of Jesus Christ my Saviour to be made partaker of life everlasting, and my body to the earth whereof it is made. Item I give and bequeath unto my daughter Judith one hundred and fifty pounds of lawful English money to be paid unto her in manner and form following, that is to say, one hundred pounds in discharge of her marriage portion within one year after my decease, with consideration after the rate of two shillings in the pound, for so long time as the same shall be unpaid unto her after my decease, and the fifty pounds residue thereof upon her surrendering of, or giving of, such sufficient security as the overseers of this my will shall like of to surrender or grant all her estate and right that shall descend or come unto her after my decease or that she now hath of in or to one Copyhold tenement with the appertenances lying and being in Stratford upon Avon aforesaid in the said county of Warwick, being parcel or holden of the manor of Rowington unto my daughter Susanna Hall and and her heirs forever. Item I give and bequeath unto my said daughter Judith one hundred and fifty pounds more if she or any issue of her body living at the end of three years next ensuing the day of the date of this my will, during which time my executors to pay her consideration from my decease according to the rate aforesaid. And if she die within the said term without issue of her body then my will is and I do give and bequeath one hundred pounds thereof to my niece Elizabeth Hall, and fifty pounds to be set forth by my executors during the life of my sister Joan Hart and the use and profit thereof coming shall be paid to my said sister Joan, and after her decease the said 50 pounds shall remain amongst the children of my said sister equally to be divided amongst them. But if my said daughter Judith be living at the end of the said three years, or any issue of her body, then my will is, and so I devise and bequeath the said hundred and fifty pounds to be set out by my executors and overseers for the best benefit of her and her issue, and the stock not to be paid unto her so long as she shall be married and covert baron but my will is that she shall have the consideration yearly paid unto her during her life and after her decease the said stock and consideration to be paid to her children if she have any and if not to her executors or assigns, she living the said term after my decease, provided that if such husband as she shall at the end of the said three years be married unto or attain after, do sufficiently assure unto her and the issue of her body, lands answerable to the portion by this my will given unto her, and to be adjudged so by my executors and overseers then my will is that the said £150 shall be paid to such husband as shall make such assurance to his own use. Item I give and bequeath unto my said sister Joan 20 pounds and all my wearing apparel to be paid and delivered within one year after my decease. And I do will and devise unto her the house with the appurtenances in Stratford wherein she dwelleth for her natural life under the yearly rent of 12 pence. Item I give and bequeath unto her three sons William Hart [name omitted] Hart and Michael Hart five pounds a piece to be paid within one year after my decease unto her. Item I give and bequeath unto the said Elizabeth Hall all my plate (except my broad silver and gilt bowl) that I now have at the date of this my will. Item I give and bequeath unto the poor of Stratford aforesaid ten pounds; to Mr Thomas Combe, my sword; to Thomas Russell, Esquire, five pounds; and to Francis Collins of the borough of Warwick in the county of Warwick, gent., thirteen pounds, six shillings, and eight pence, to be paid within one year after my decease. Item I give and bequeath to Hamlett Sadler 26s 8d to buy him a ring; to William Reynolds, gent., 26s 8d to buy him a ring; to my godson William Walker 20s in gold; to Anthony Nash, gent., 26s 8d; to Mr. John Nash, 26s 8d; and to my fellows John Heminge, Richard Burbage, and Henry Condell 26s 8d a piece to buy them rings. All that capital messuage or tenement with the appurtenances in Stratford aforesaid called the New Place, wherein I now dwell, and two messuages or tenements with the appurtenances situate, lying and being in Henley Street within the borough of Stratford aforesaid. And all my barns, stables, orchards, gardens, lands, tenements, and herediments whatsoever, situate, lying, and being, or to be had, received, perceived, or taken within the towns and hamlets, villages, fields, and grounds of Stratford upon Avon, Old Stratford, Bushopton, and Welcombe, or in any of them in the said county of Warwick. And also all that messuage or tenement with the appurtenances wherein one John Robinson dwelleth, situate, lying and being in the Blackfriars in London near the Wardrobe, and all other my lands, tenements and hereditaments whatsoever. To have and to hold all & singular the said premises with their appurtenances unto the said Susanna Hall for and during the term of her natural life and after her decease to the first son of her body lawfully issuing, and to the heirs males of the body of the said first son lawfully issuing and for default of such issue to the second son of her body lawfully issuing and to the heirs males of the body of the said second son lawfully issuing and for default of such heirs to the third son of the body of the said Susanna lawfully issuing and of the heirs males of the body of the said third son lawfully issuing. And for default of such issue the same so to be and remain to the forth, fifth, sixth, and seventh sons of her body lawfully issuing, one after another, and to the heirs males of the bodies of the said forth, fifth, sixth, and seventh sons lawfully issuing in such manner as it is before limited to be and remain to the first, second and third sons of her body and to their heirs males. And for default of such issue the said premises to be and remain to my said Niece Hall and the heirs males of her body lawfully issuing for def[ault of]…[damaged]…such iss[u]e to my daughter Judith & the heirs males of her body lawfully issuing. 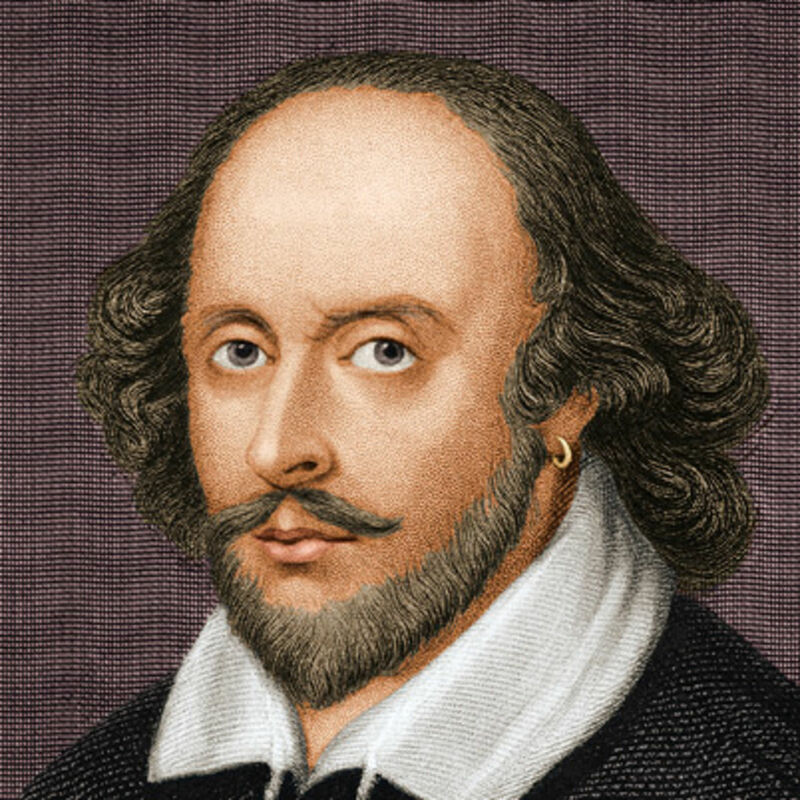 And for default of such issue to the right heirs of me the said William Shakespeare forever. Item I give unto my wife my second best bed with the furniture. Item I give and bequeath to my said daughter Judith my broad silver gilt bowl. All the rest of my goods, chattel, leases, plate, jewels, and household stuff whatsoever, after my debts and legacies paid and my funerall expenses discharged, I give, devise, and bequeath to my son in law John Hall, gent., and my daughter Susanna, his wife, whom I ordain and make executors of this my last will and testament. And I do entreat and appoint the said Thomas Russell, Esquire, and Francis Collins, gent., to be overseers hereof. And do revoke all former wills and publish this to be my last will and testament. In witness whereof I have hereunto put my hand the day and year first above written. Johannis Hall unius executorum etc. Cui etc. Tagged Arts and Culture, Shakesepeare.